It has been quite a while since we have met on this page. Let us hit the high spots of the spring and summer. Winter lasted far longer than it usually does. While we occasionally have a blizzard in the first week of April, the snows that come are the spring snows – wet and warm and gone in 3 days or so. This year, however, we experienced January temperatures in April. Wind chills of -17 F visited us more than once, and the low temperatures destroyed the peach orchards. Folks around here have still not recovered, and many are protesting the need to prepare for the upcoming winter. Our only real “summer” occurred last week. Winter is still fresh in our memories. I had an out-of-town trip the last full week of April. Trips like this, while fairly routine, still require the unexpected decision. This time, I left on a Saturday and returned a week later on Sunday. This timetable did not coincide with the garbage pickup timetable. It was cold outside, though, so I left the can locked inside the Temple’s garage and happily went on my trip. The temperature warmed up while I was gone, though, and the garbage can smelled pretty ripe by the time I returned. Once again, I decided not to put the can out early and to wait until Monday to avoid the possibility of raccoons raiding the contents of the garbage. I did walk through the Temple grounds and noted that the spring bulbs were coming out all at once. It looked as if Gaia was a month late, but that She was still determined to get all Her glorious plants in bloom. By 4:30 that afternoon, a massive thunderstorm rolled off Lake Erie. The sky became as dark as night, and thunder began to sound. As I unpacked, I watched for lightning. The next sound I heard, though, was louder than the thunder – a terrible crash that sounded as though something had fallen on the Temple. I ran to the back door, but stopped as the first of a series of lightning streaks danced across the sky. I checked the Temple and the garage from the inside, but found no damage. And so, it was the next morning before I could investigate outside as to what I had heard. 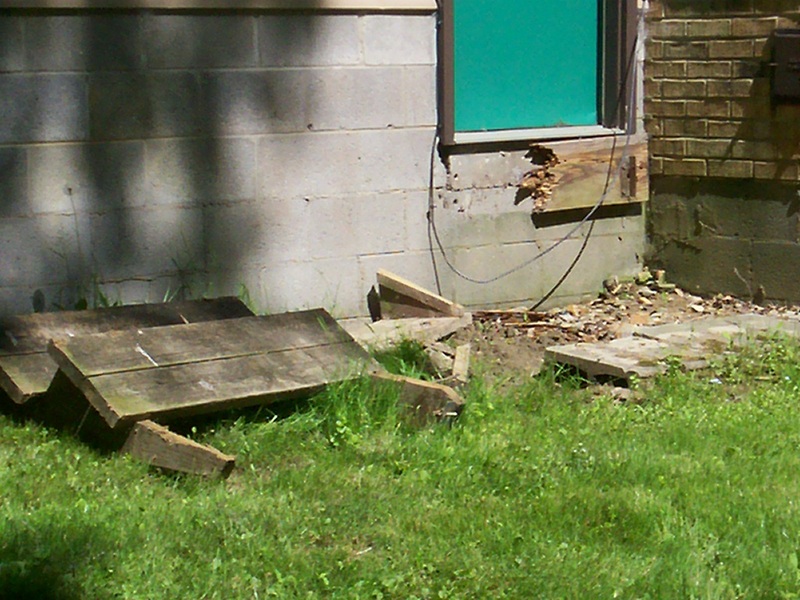 The steps from the garage to the Temple’s back yard had been ripped from the building. These steps were wooden. There were three of them, and I will admit to the bottom step being slightly loose. The steps were secured to a facing board, which was anchored into the cement block foundation of the garage. 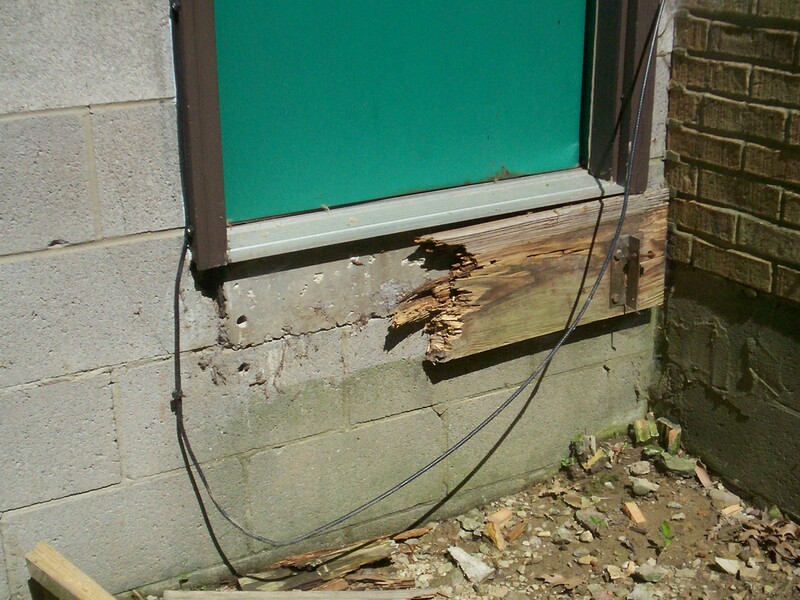 The facing board had been ripped off the foundation, splintered in half, and the steps had been tossed a few feet into the yard. Fresh tooth and claw marks were visible on the wood. No feral cat had done this. Raccoons were not this strong. Foxes and coyotes could not have done this, either, nor could the white-tailed deer. The only animal around that had this power and ability was a bear. A hungry bear, fresh from hibernation, would have found little food in this partially winter landscape. The smell of the garbage can must have been tantalizing. And, once at this location, bear was confronted by a locked metal door and three wooden steps, the bottom one of which possibly made him lose his balance. In frustration, he would have lashed out. The lightning, though, would have sent him looking for cover. Looking back, I wonder where that cover would have been. Would he have made a dash for the woods on the Temple grounds? Would he have gone under the deck at the Temple’s back door? And, if I had run out in the dark to look for the source of the crash, would I have been confronted by a hungry, angry bear? Gaia and Zeus give us signs to help us navigate this world. Let us be aware of those signs. No longer, in the modern world, do we keep the messages from Gaia in the forefront of our minds. Those messages, though, are still present. Be aware of them. And stay inside when lightning flashes.